Remote trainers can be used to teach and reinforce training commands and to change undesirable behaviors. They are also an effective way of communicating with your dog even when he is too distracted or too far away to hear you. Remote Trainers let you send a signal from a handheld transmitter to a receiver collar worn by your dog. The signal gets the dog’s attention and can be used to teach and reinforce training commands and to change undesirable behaviors. The BigLeash is a safe and effective training tool with more user-friendly features than other remote trainers. 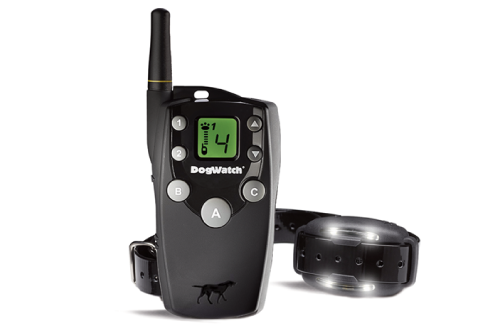 It is the only remote trainer with digital FM technology and exclusive ‘In-Touch’™ two-way communication between the hand-held transmitter and the dog’s receiver collar. Paragraph: Easily activated from the hand-held transmitter, the Firefly® feature with 4 LED lights is great for walking your dog at night or locating him in the dark. The LCD display on the BigLeash gives you more information than any other remote trainer. All the information you need is available at-a-glance, keeping you fully informed of the transmitter & receiver status, battery status, training level and your dog's distance from you. This important feature helps you stay safely connected with your dog via the visual range indicator on the LCD screen that shows you if your dog is going out of range – so you can call him back before it's too late. The BigLeash Remote Trainer offers 15 training levels (levels of stimulation) to accommodate a wide variety of training needs and pet personalities, but not so many that picking the correct level requires an advanced degree. Select the signal you need, when you need it – audible or vibration, brief or continuous. The signal from the dog’s receiver collar can get your dog’s attention or distract him from an unwanted behavior. By obeying your obedience command or by stopping the undesired behavior, your dog quickly learns to avoid and/or stop the tone or sensation which is delivered by the receiver collar. Will the stimulation signal hurt my dog? The “stimulation” from the collar is intended to distract your dog by delivering an unpleasant but harmless sensation similar to the static shock you receive after walking across a carpet in your socks. The BigLeash training collar provides you with multiple stimulation levels. Most dog trainers find they can achieve their desired results using a low intensity stimulation, often barely perceptible to humans. All BigLeash models also include both an audible and a vibration signal which allows you to condition your dog to associate the audible tone or vibration with the training correction, thus eliminating the need for the stimulation altogether. Which stimulation level is correct for my dog? Always start with the lowest level and work your way up as needed. You will know you have found the proper stimulation level when your dog responds to the stimulation with only a mild twitch or perk of the ears or like you have given him a quick tug on a leash. What is the difference between “Brief” and “Continuous” stimulation? Brief stimulation is a quick “attention getter” that lasts only for a fraction of a second, regardless of how long you press the button. This stimulation has been described as feeling like a mosquito bite. Continuous stimulation is a pulsating stimulation that continues until you release the transmitter button (up to 8 seconds maximum). What kind of safety features does the S-15 BigLeash have? In addition to having 15 training levels as well as audible and vibration modes, the BigLeash can be set to level “0” so that you will not accidentally send a signal when you have the collar on the dog but are not actively using the trainer. Additionally, the BigLeash includes an automatic shut-off feature that limits the continuous stimulation to 8 seconds. What age should my dog be before I begin using a remote trainer?